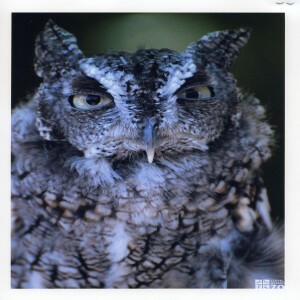 The range of the Eastern Screech Owl is North America. The habitat of the Eastern Screech Owl is open woodlands, forest clearings, old orchards, suburban parklands. Clutch: 2 to 6; usually 4. Larger and older females lay larger clutches. Eastern Screech Owls are strictly nocturnal. They do not migrate. Screech owls are exceptional hunters. The only time they screech is during the brief period when their babies have just left the nest and are beginning to fly. Instead, they trill, often in duet form, beginning and ending in perfect synchronism. Sometimes the trill is pitched at harmonic intervals of a third or a fifth. Eastern Screech Owl nests are in natural tree cavities, old woodpecker holes, or man-made nesting boxes. Nests may be as high as 60 feet above the ground, or as low as 4 feet. The female is in charge of incubation and brooding. The male supplies all thye food to the female during this period. Females deliberately choose very small males, and mate for life. Although the female may sacrifice the eggs if attacked, she will vigorously defend the fledglings. Screech owls defend their young so strongly that they have earned the description, “feathered wild cats”. Mainly insects. During winter months birds, small mammals, and reptiles are consumed.